Week 8 of the smash hit show Dancing with the Stars had a very special guest in the shape of our front man, Gary Harpur. It was Orchestra Night and in a bit of a diversification form the usual set list, he performed four songs to a studio and live TV audience. Click on the below link to see him open the show with the David Bowie classic, ‘Let’s Dance’. Of course, it’s not the band’s first association with the RTE Concert Orchestra. The guys were accompanied by them on The Late Late Show performing Live and Let Die and Video Killed The Radio Star to great acclaim. The Harleys are to perform a number of gigs in the Fest Alm, Bad Hofgastein for the Topflight Today FM Ski Trip with The Ian Dempsey Breakfast Show in January 2019. This is the fourth time since 2015 the guys have made the trip and are promising to make it even better than before this time! More dates in UK and Germany to follow….. The run up to Christmas 2018… (oh my GOD where did that year go?!!….) 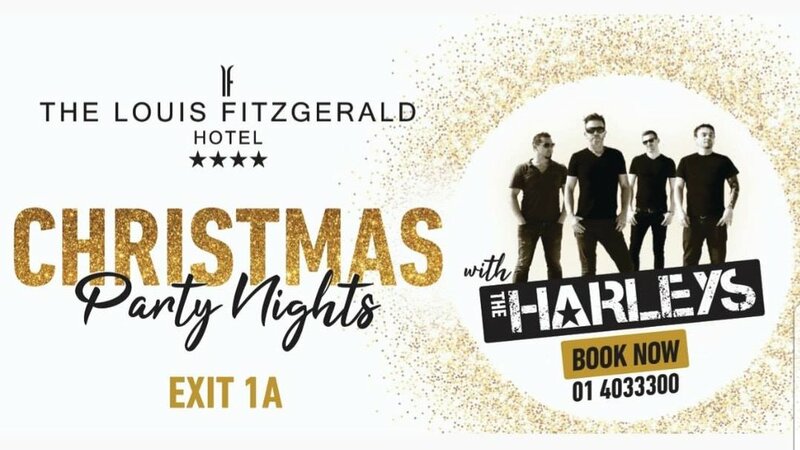 sees The Harleys don the Santa Suits and Dust off the tinsel in The Louis Fitzgerald Hotel Naas Road. Enjoying a fantastic few years performing in The Louis Fitzgerald Group’s bars such as The Quays in Galway and The Roost in Maynooth, the boys would love to see you there. For booking details, please call 01 403 3300. IT’S CHRIIIIIISSSSSSTMAAAAAAASSSSSS!!! Below are some pics of the band, with Niamh Van Rensburg joining Gary on Vocals, performing in the packed 365 Arena, Kirchberg, Austria on th 31st January 2018. Schätzer Alm was the scene for what was to be a most fantastic event....The Harleys Unplugged!! Following on from Paul Collins' (Today FM) Puc Fada Competition, the Irish Skiing contingent came indoors to be entertained by the band with a two hour set of all things pop, rock and Irish without the electric guitars. With the sub zero temperatures outside, the glu win was in full flow - Fantastic day! For the third time in four years, The Harleys have been invited to perform at the Topflight Today FM Ski Trip as part of the band's 2018 European Tour. Opening in The Tiroler, Kirchberg on Sunday 28th January, the guys are very excited to be performing with Picture This in the 365 Arena, Kirchberg on 1st February. Already sold out, the trip promises to be another exciting string to The Harleys collection of bows! January 2018 will see the guys performing outside in sub zero temperatures at the 2018 Urban Ice Festival, Bad Gastein, Austria. Though very tempted to have a go at scaling the towering structure, The Harleys will instead be entertaining the crowds on both the Thursday and Friday evenings of the event. 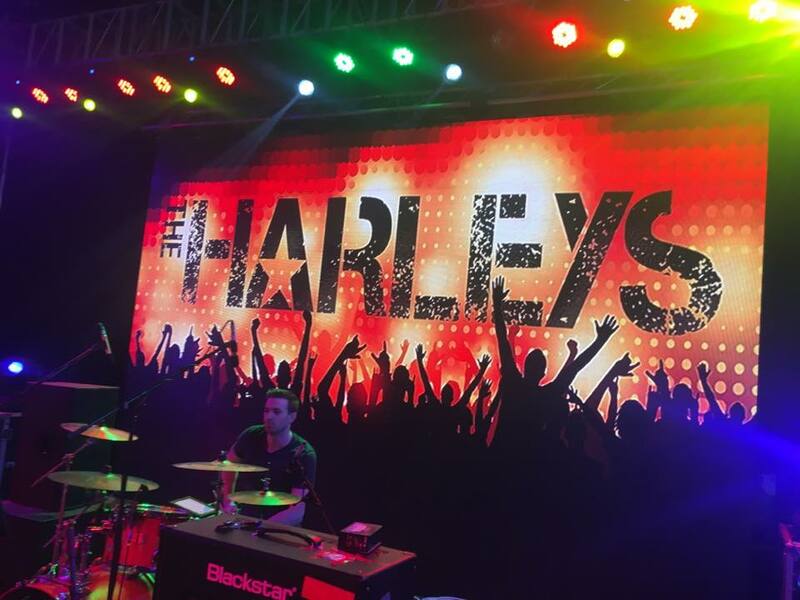 On what has been The Harleys third visit to the Gulf in the last 18 months, a record crowd turned up to see the lads play on a balmy evening in Saar in November. There are unfounded rumours the trip was sponsored by Labatts Ice and Jim Beam......., but the team are eternally greatful to The Bahrain Irish Society and the staff at The Radisson Diplomat in Manama for the royal treatment provided to the band. Third time out to Austria with Topflight was always going to be a great way to start the year. The Double Header in The Tiroler, Kirchberg was a statement by everyone there for the week....This is going to be fun!! After the success of the first leg of the European Tour covering Manchester, London, Salzburg and Bad Gastein, the guys were joined by Niamh Van Rensburg for the week and proceeded to win many friends, woo many revellers and secure the gig for 2019!! Welcome to our page. Everybody who has booked us has started here and we hope that you will be joining that group of satisfied clients. We are a band of four full time musicians with decades of professional experience behind us. We have been together for a number of years now and enjoy the fact that we are one of the busiest bands in the country on the wedding, festival and venue circuits. Finalists in the Mrs2Be Wedding Band of The Year over the last number of years, we have also been the headline act the Ian Dempsey Today FM Topflight Ski Trip in 2015, 2017, 2018 and now the upcoming trip in January 2019. We understand the importance to you of selecting the right band for your event and that often, the success of an event can be down to the choice of entertainment. It is a responsibility we thrive on and have a 100% positivity rating in our endorsements and testimonials. Singer and guitarist. He has performed across four continents over the past number of years in many productions. Aside from fronting the band, he can boast to have performed as lead vocalist with Riverdance in Asia, Europe and of course, Dublin. In recent years, he has performed in the band for The Voice of Ireland and provided vocals and guitar for Shinawil's smash hit production, Dancing With the Stars. Guitarist and Singer. Born in South Africa. Kempton High school in South Africa is where Danie’s musical career was born. He is now one of the most respected and aspired to guitarists in Ireland. Danie played with South African rockers, Franklin before joining one of South Africa’s biggest selling bands, Just Jinjer, who over the last decade, performed and toured with U2, Counting Crows, Def Leppard, INXS, Maroon 5, One Replublic, Hootie and the Blowfish, and The Strokes among many others. Musicians in Ireland will tell you that Danie is not only one of the greatest guitarists around, but more that he is probably one of the most respected. Drummer and Singer. Professional for over fifteen years Paul has always focused on his desire to learn the finer art of music and strive for more experience in the music world. Paul is a leader on the Irish Drums and Percussion scene also no stranger to the studio. To date, he has recorded with artists in Ireland, the UK and New York and having worked with producers and engineers such as Mark Carolyn (Muse), Ronan McHugh (Def Leppard) Stephen Lipson (Pet Shop Boys), Philip Magee (Kodaline). He also had a song featured on MTV’s “The Real World” and was nominated for a meteor award in 2008. When you see The Harleys perform, you will see first hand that his real passion is playing live. One of the toughest decisions in arranging your wedding is what band to chose for your big night. With The Harleys, you are safe in the knowledge that you have booked one of the most sought after acts on the Irish Wedding Circuit. Our testimonials have been 100% positive. Most of our wedding bookings have come from couples who have seen us perform at weddings of friends/relations of theirs. Our extensive song list and years of experience performing at weddings guarantee a full floor and great evening of top class entertainment. Performing at a wedding party is all about you and your guests. Integrating the greatest hits from the last 40 years into the set 100% ensures that every one of your guests will be shouting for more come the end of the night. All our clients want want on their night is a full dance floor, quality music, good sound and personal interaction between the band and your guests. We are happy to meet couples to discuss their musical tastes and requests and will incorporate your favourite songs into your night. We also offer a DJ service, an acoustic musical outfit for arrival at your reception and acoustic residents’ bar after-show party. Here is a recent review form Radio Nova. Click to see our ‘Gig Guide‘. Please contact us for more information, Thanks! A link to our testimonials is currently under construction. If you wish to receive a PDF of our endorsements please send an email requesting same to info@theharleys.ie. We apologise for any inconvenience. If you need information or would like to book the band, please submit the below form.